Autumn can be an exciting time to be married. The choice of season is according to your individual tastes. This unforgettable event is just as individual as the bride herself. Right here on the panhandle of Florida, brides plan for months to be married on our sugar white beaches. October and November are especially popular because Florida’s heat is no longer an issue. Within the peak of the fall season, many a Spa and Salon find themselves working longer hours so the bride and her wedding party can look their best with beautiful hairstyles for a beach wedding. Grasp this picture within your mind: lazy dunes of pure white sand, sparkling with a background of water that has tri-colors of turquoise and assorted blues. You hear the placid waves gently brushing the shores on a bright sunny day. The Bride and her mother have waited for this moment for many months and she looks stunning. What could go wrong on such a day? Clouds could form and rain could come. There could be a hurricane forecast to blast into this lovely serene setting, after all, it’s happened before, or the very worst thing that could ever happen to a bride would be for her to have the wrong hairstyle. We are going to talk about this in depth. With autumn comes the turning of leaves and fortunately, not everyone wants to be married on the beach. The majority of couples are still desirous of a grand church wedding. You hear a crackle when you step on a fallen branch as you look up into your love’s face. Being encircled by the painting of color of leaves, romance warms your heart and sets the stage of your wedding. This is the season where nature says “good night” for awhile and takes a much needed rest. Oh yes, this is the season you are going to be married in! The selection of colors for the bride’s wedding party should reflect her personality and desire. Not her mother’s or her aunts but totally her. Just because she gets married in the fall doesn’t mean she cannot have her party arrayed in lilac, violet or reds if these are her favorite colors. I have personally seen lilac, violet and red leaves in the fall! The more adventurous would rather skydive in unison to give their hearts promises to one another while the leaves are turning. We aren’t going to “go there” about her hairstyle in the heavenlies. Although your hairstyle really depends upon what you like and your personality, one important tip to consider when you walk on the beach or down the aisle is to remember where you are at. For example, if you are on the beach or in a gazebo outside you do not want an updo that is so cemented with spray the breezes will not blow a tendril. Wearing your hair up for an outdoor wedding can be very good, if it is done right. A simple sophisticated twist with a few tendrils can go along way. A formal air is brought to a beach or gazebo type of environment if the veil is worn on top of the twist. When the veil is worn just below the top of the twist or curls there will be unification with the informal outdoor environment. Loose curls lying upon more loose curls are another option when a romantic look is sought. There are so many selections. Your beau is in love with who you are and you want to reflect exactly that. Who you are! What type of “do” do you do? Let us think about your type of personality first. Are you the old fashioned type who would like to wear her mother’s wedding gown in off white and likes flowing gowns, ruffles or lace? If you have long hair, would you like to wear your hair loosely around your shoulders? Perhaps half up and half down might be right for you. This is the best of both worlds. Wearing your hair up would bring the formality of the Church wedding, yet partially down would bring a whimsical look. 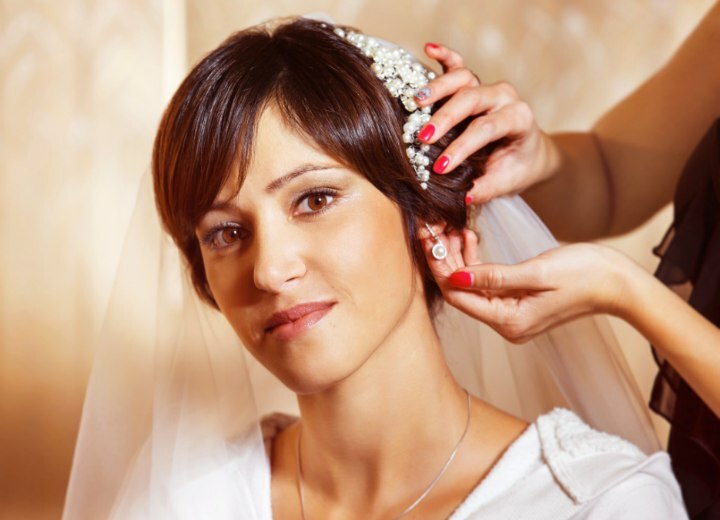 Wearing your veil over your face would bring the coveted moment of yesterday to your event. If your hair is short you might consider a small hair piece to bring graceful curls to flatter the nape of your neck. 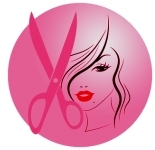 Your stylist should be able to give you many options to choose from. Maybe you are more of a modern thinker and would like to have a strapless dress made of satin. No ruffles, lace or long chain for you, something simple and to the point, yet very formal. If you have long hair, you’d probably want to wear it up smoothly, but not boldly with very few tendrils. Something for you to remember on this occasion is to allow a little softness to be framed around your face. If your hair is short, have a new cut about two weeks before your wedding and this will give it time to be out of shock and settle into the new style. You will also have about one-fourth new growth and it should be perfect for your day. The short cut you have depends upon what you are visualizing what you see yourself looking like. Bring a picture to your Stylist and she will tell you whether you will look good in that or if your hair is practical for the style you selected. A lot depends upon the texture of your hair, your figure and your face too. What about thin hair, waves or tight curls? Should you wear hair ornaments or would this be too much? Stay tuned, we will discuss those very subjects in the next article.